Endometriosis, although not malignant, has clinically demonstrated properties of invasiveness and metastasis. The pathogenesis of endometriosis, however, has not yet been elucidated. The immunological differences between endometriosis and malignant gynecologic tumors were analyzed by assessing C-type lectin receptors, which are associated with innate immunity, and immunoglobulin secretion, which is associated with B cell adaptive immunity, in the peritoneal fluid of these patients. Peritoneal fluid samples were obtained from 42 patients with benign masses (control group), 38 with endometriosis, and 43 with gynecologic (ovarian, uterine, and cervical) cancers. 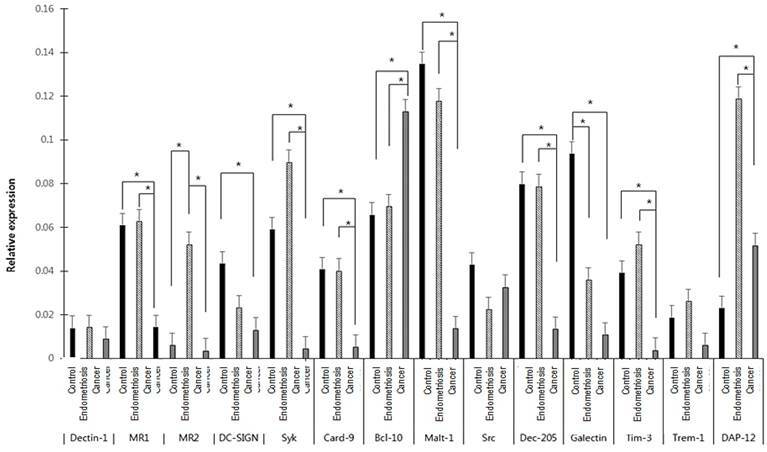 The levels of expression in these samples of mRNAs encoding the C-type lectin receptors Dectin-1, MR1, MR2, DC-SIGN, Syk, Card 9, Bcl 10, Malt 1, src, Dec 205, Galectin, Tim 3, Trem 1, and DAP 12, were measured by real-time reverse transcription polymerase chain reaction, and the concentrations of IgG, IgA and IgM were measured by enzyme-linked immunosorbent assays (ELISA). Findings in the three groups were compared. The level of galectin mRNA was significantly lower, and the levels of MR2 and DAP 12 mRNAs significantly higher, in the endometriosis than in the control group (p<0.05 each). Compared with the gynecologic cancer group, the level of Bcl 10 mRNA was significantly lower, and the levels of MR1, MR2, Syk, Card 9, Malt 1, Dec 205, Tim 3, and DAP 12 mRNAs significantly higher, in the endometriosis group (p<0.05 each). The levels of MR2 and DAP 12 mRNAs were significantly higher in the endometriosis than in the control group (p<0.05 each), whereas the level of galectin mRNA was similar in the endometriosis and gynecologic cancer groups. IgA and IgG concentrations in peritoneal fluid were significantly lower in the gynecologic cancer than in the control group (p<0.05 each). However, concentrations of all three immunoglobulins in the endometriosis group did not differ from those in the other two groups (p>0.05). C-type lectin receptors and immunoglobulins act cooperatively and are closely associated in the pathogenesis of endometriosis. The decreased expression of galectin mRNA in the peritoneal fluid of the endometriosis group suggests that endometriosis and gynecologic cancers have similar immunologic characteristics. Endometriosis is a disease associated with chronic pelvic inflammation. In addition to being a major cause of pelvic pain, endometriosis may be accompanied by dysmenorrhea, dyspareunia, infertility and menstrual irregularities. Although not a malignant disease, endometriosis invades surrounding organs [1,2]. The progression of endometriosis leads to the reaction of immune cells and their secretion of effector molecules into the abdominal cavity. Few studies to date, however, have analyzed the roles of C-type lectin receptors and their adaptor molecules in endometriosis, including the roles of components of the innate immune system, such as pattern recognition receptors (PRRs), Toll-like receptors (TLRs), and cytoplasmic nucleotide-binding oligomerization domains (NOD)-like receptors (NLRs)[5,6]. This study therefore investigated components of the innate immune response, including C-type lectin receptors and their adaptor molecules; components of the acquired immune response, such as immunoglobulins (Igs); and their relationship to each other in the peritoneal fluid of patients with endometriosis. The relationship between these factors and the clinical characteristics of these patients was also analyzed. These findings were compared with results obtained from groups of patients with benign and malignant diseases. Intraperitoneal fluid samples were collected during laparoscopy or laparotomy from 123 patients with gynecologic disease. Peritoneal fluid was collected aseptically from the Douglas pouch, taking care to avoid bleeding. Patients with a hormone producing condition, including pregnancy; those without peritoneal fluid and those with peritoneal fluid contaminated with blood; those with peritonitis; and those with any other immunologic disease were excluded from the study. Peritoneal fluid samples were centrifuged at 1800 x g for 10 min; the supernatants were stored at -80°C in 1.5 ml aliquots; and the cell pellets were stored at -80°C in 1.5 ml aliquots after adding RNase inhibitor. The study protocol was approved by the institutional review boards (IRBs) of St. Vincent's Hospital, The Catholic University of Korea, with all patients providing written informed consent (VC16TISI0148). Total RNA was purified from peritoneal fluid using TRIzol solution, according to the manufacturer's protocol (Invitrogen, Carlsbad, CA, USA). First-strand cDNA was synthesized from 1 μg aliquots of total RNA using a reverse transcription system with random hexamers (Promega, Madison, WI, USA) according to the manufacturer's protocol. Real-time PCR was performed on a StepOnePlus real-time PCR system with Power SYBR Green PCR Master Mix (Applied Biosystems, Foster City, CA, USA). Each 20-µl PCR reaction mixture included 1 µl of cDNA, 10 µl of Power SYBR Green PCR Master Mix, 2 µl of primers (Table 1), and 7 µl of PCR-grade water. The amplification protocol consisted of an initial denaturation at 95 °C for 10 min, followed by 40 cycles of denaturation at 95 °C for 15 s and annealing and extension at 60 °Cfor 1 min. The crossing points of the target genes with β-actin were calculated using the formula 2-(target gene-β-actin), and relative amounts were quantified. Abbreviations: RT-PCR, reverse transcriptase-polymerase chain reaction; Dectin-1, dendrite cell-associated C-type lectin-1; MR1, mannose receptor 1; MR2, mannose receptor 2; DC-SIGN, dendritic cell-specific ICAM3-grabbing non-integrin; Syk, spleen tyrosine kinase; Card-9, caspase-recruitment domain family, member 9; Bcl-10, B cell lymphoma 10; Malt-1, mucosa-associated lymphoid tissue lymphoma translocation gene 1; Src, steroid receptor co-activator; Dec-205, Dendritic and epithelial cell-205; Tim-3, T cell immunoglobulin mucin-3; Trem-1, triggering receptor expressed on myeloid cells-1; DAP-12, DNAX-activating protein of 12 kDa. All samples of ascites fluid were stored at -80°C, and their IgG, IgA, and IgM concentrations were measured by enzyme-linked immunosorbent assay (ELISA, Bethyl, Montgomery, TX, USA). Briefly, 100 μl of diluted 1:100 goat anti-human IgA, IgG, IgM in coating buffer (0.05 M Carbonate-Bicarbonate, pH 9.6) were placed in each well of a 96-well plate, and the plates were incubated at room temperature for 1 h. The wells were washed five times, blocking antibody was added, followed by the addition of 200 μl of sample, and the plates were incubated at room temperature for 30 min. The wells were washed five times, 100 μl of diluted goat anti-human IgA, IgG, IgM-horseradish peroxidase (HRP) were added to each well, and the plates were incubated at room temperature for 1 h. The plates were washed five times, 100 μl of tetramethylbenzidine (TMB) substrate solution were added, and the plates were incubated for 15 min in the dark at room temperature, followed by the addition of 100 μl of stop solution. The plates were read at an optical density of 450 nm on a microtiter plate reader. Antibody titers were calculated by comparing the optimal density of sample wells to those of standard serum. All ELISA tests were performed in duplicate and their means were calculated. The Kolmogorov-Smirnov test was used to assess normality and Levene's test was used to assess the equality of variances between groups. Between group-differences in expression were determined using independent t-tests, with correlations assessed using the Pearson correlation test. All statistical analyses were performed using SPSS version 13, with a p-value less than 0.05 considered statistically significant. This study enrolled 123patients, comprising 42controls, 38with endometriosis, and 43with gynecologic cancers. Mean overall patient age was 44± 3.3 years in the control group, 31± 4.4 years in the endometriosis group and 56± 4.7 years in the gynecologic cancer group. Expression of mRNAs encoding all C-type lectin receptors assayed was observed in the effusion fluid samples of patients in all three groups. The levels of mRNAs encoding all C-type lectin receptors, except Bcl-10, Src, and DAP-12, were significantly lower in the gynecologic cancer than in the control and endometriosis groups. For example, the levels of MR1, Syk, Card 9, Malt 1, Dec 205, Galectin, and Tim 3 mRNAs were significantly lower, while the level of Bcl 10 mRNA was significantly higher, in the gynecologic cancer than in the other two groups (p <0.05 each). In addition, the level of DAP 12 was significantly higher in the gynecologic cancer than in the control group (p <0.05). The levels of MR1, Syk, Card-9, Malt-1, Dec-205, Tim-3, and DAP-12 mRNAs were significantly higher, while the level of Bcl-10 mRNA was significantly lower, in the endometriosis than in the gynecologic cancer group (p <0.05 each). In addition, the level of MR2 mRNA was significantly higher in the endometriosis than in the control and gynecologic cancer groups (p <0.05). Levels of secreted IgG, IgA, and IgM were significantly lower in the gynecologic cancer than in the control and endometriosis groups (p<0.05 each). However there were no significant differences between the endometriosis and control groups (p>0.05). In the control group, DC-SIGN and DAP 12 mRNA levels correlated with IgG concentration and Src mRNA level correlated with IgM concentration. 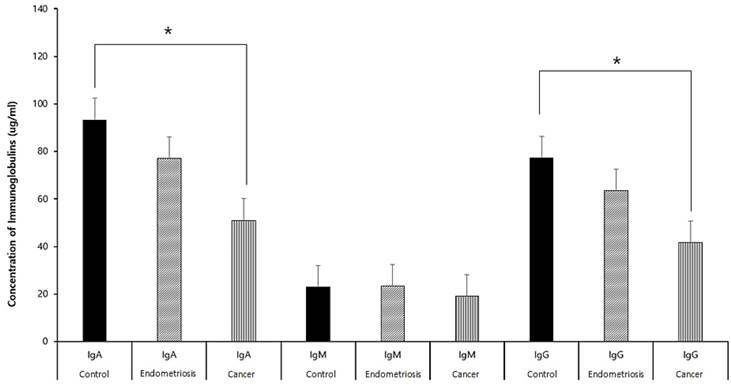 In the endometriosis group, Bcl 10 mRNA level correlated with IgA concentration, and Syk and Trem 1 mRNA levels correlated with IgM concentration. In the gynecologic cancer group, DC-SIGN mRNA level correlated significantly with IgG concentration, and Syk mRNA level correlated significantly with IgM concentration (p<0.05 each). Endometriosis is a leading cause of pelvic pain, dysmenorrhea, dyspareunia, and infertility, but its pathophysiology is not yet known. In particular, the immunological aspects of its pathophysiology are thought to be related to the innate immune response, but the exact mechanisms remain unknown [2,3]. Although symptom severity does not correlate with the progression of endometriosis, the latter involves the secretion of various molecules, including cytokines, chemokines, and Igs. Autophagy, ER stress, and immune cells are also involved in the progression of endometriosis. All of these factors are associated with symptoms of this condition. Initially, gynecologic cancers are limited to the primary lesion but gradually progress to invasion and/or metastasis to other organs. Pathways are primarily lymphatic, hematogenous, and direct metastasis, which produce malignant ascites fluid in the abdominal cavity. Although endometriosis is a benign disease, its infiltration of peripheral organs and invasion of distant organs resembles metastasis of malignant disease[7-9]. PRRs are important constituents of the innate immune system that recognize and bind to pathogen-associated molecular patterns (PAMPs) on pathogens. Types of PRRs include TLRs, NLRs, retinoic acid-inducible genes (RIG-I) and C-type lectin receptors. Excessive upregulation of PRRs may accelerate cell proliferation in endometriosis and may be associated with carcinogenesis. We previously reported that mRNAs encoding TLRs-1, -2, -4, -5, -6, and -9 and NODs-1 and -2 were expressed in both endometriosis and non-endometriosis benign diseases, with the levels of expression of TLR-2 and -9 and NOD-1 and -2 mRNAs being significantly higher in patients with than without endometriosis. These findings suggest that innate immune activity is increased in the abdominal cavity of patients with endometriosis, and therefore may be involved in the pathophysiology of endometriosis[10-12]. Correlations between levels of mRNAs encoding CLRs and immunoglobulin concentrations in the control group. Correlations between levels of mRNAs encoding CLRs and immunoglobulin concentrations in the endometriosis group. Correlations between levels of mRNAs encoding CLRs and immunoglobulin concentrations in the gynecologic cancer group. The aim of this study was to compare the expression of mRNAs encoding CLRs and their adaptor molecules associated with innate immune responses, as well as their patterns of expression, in patients with benign diseases, endometriosis, and malignant tumors. We found that mRNAs encoding 14 types of C-type lectin receptors and their adaptor molecules were expressed in all intraperitoneal fluid samples of the three groups. Relative to the other groups, Malt-1 mRNA was higher in the normal control group, DAP 12 mRNA was higher in the endometriosis group, and Bcl-10 mRNA was higher in the gynecologic cancer group, indicating that type of disease affects the expression of mRNAs encoding different types of C-type lectin receptors and their adaptor molecules in the abdominal cavity. The endometriosis group differed from the gynecologic cancer group, in that the levels of MR1, MR2, Syk, Card 9, Malt 1, Dec 205, Tim 3, and DAP mRNAs were higher and the level of Bcl 10 mRNA lower in the endometriosis group. The endometriosis group also differed from the normal control group, in that the levels of MR2 and Dec 205 mRNAs were higher and the level of galectin mRNA lower in the endometriosis group. These findings suggest that MR2, Dec 205, and Galectin mRNAs, which have the same expression patterns in endometriosis and cancer patients, but differ in the endometriosis and control groups, are associated with the progression and spread of endometriosis. Endometriosis is an autoimmune disease, characterized by an increase in specific IgG autoantibody in peritoneal fluid and significant increases in IgG and IgA in endometrial glandular epithelial cells. Moreover, it has been suggested that patients with increased IgG should be treated for possible "precursor endometriosis" [13-15].This study found that IgG, IgA, and IgM were secreted into the peritoneal fluid of patients in all three groups. The concentrations of secreted IgA and IgG were significantly lower in the gynecologic cancer than in the control group. However, the concentrations in the endometriosis group did not differ from those in each of the other groups. This study also tested correlations between CLR mRNA levels and Ig secretion in the abdominal cavity. In the normal group, DC-SIGN and DAP 12 mRNA levels correlated with IgG concentration and Src mRNA level correlated with IgM concentration. In the endometriosis group, Bcl 10 mRNA correlated with IgA concentration and Syk and Trem 1 mRNA levels with IgM concentration. In the gynecologic cancer group, significant correlations were observed between DC-SIGN mRNA and IgG and between Syk mRNA and IgA. Expression of C-type lectin receptors, Ig secretion, and their mutual interactions constitute complex immune responses, making it difficult to understand the pathophysiology of endometriosis simply by assessing their expression, secretion and correlation. This study had several limitations. First, we assessed effusion fluid, not tissue samples. Immune responses in the abdominal cavity may differ from immune responses in tissues and organs. Second, the present study assessed mRNA, not protein, levels. Therefore, we may have included samples in which mRNA is expressed but protein is not. Third, we did not correlate immunity with the severity of disease; and in patients with gynecologic cancer group, we did not correlate immunity with cell type, stage, or degree of differentiation. We observed expression of mRNA of 14 types of C-type lectin receptors and their adaptor molecular mRNA in the effusion fluid of patients in the control, endometriosis, and gynecologic cancer groups. And Malt-1 mRNA in normal control group, DAP 12 mRNA in endometriosis group, and Bcl-10 mRNA in gynecologic group is higher than the other groups. Intraperitoneal IgG, IgA, and IgM were secreted in the control group, endometriosis, and gynecologic cancer group. IgA and IgG concentrations in peritoneal fluid were significantly lower in the gynecologic cancer than in control group. CLRs and their adapter molecules mRNA and IgG, IgA, and IgM act cooperatively and are closely associated in the pathogenesis of endometriosis. This work was supported by the National Research Foundation of Korea (NRF) grant funded by the Korea government (MEST) (No. 20120009380), (No. 2017R1D1A1B03030021), and Korea Gynecologic Cancer bank [KGCB]) of the Infrastructure Project for Basic Science of the Ministry of Education, Science, and Technology (MEST), Korea.